Waiting for Doggo is one of the lovely Sunday afternoon reads that you can curl up with, with a relaxed style of writing. This is a book that you can easily read in one sitting. The story opens with Daniel’s long term girlfriend Clara leaving him a ‘Dear John’ letter she has packed up and left to go and find herself. Thing is Dan is not being left on his own Clara has left him with ‘Doggo’ Clara found him at Battersea Dogs Home but Doggo is described in the book as ‘ugly’ and nearly bald to go with it. Daniel is really down on his luck and his life is just falling apart around him and the last thing he needs now is to be left with ‘Doggo’ Clara’s ugly dog. So the next step for Daniel is to try and return Doggo to Battersea Dogs Home and even that goes wrong when they insist that Doggo must lose his ‘Manhood’ as part of the agreement on entry to the dogs home. So Daniel returns home with Doggo. The story begins for Daniel and Doggo and the pair are very soon inseparable. The story from here is quirky, funny and one you just find impossible not to like. One quirking characteristic about Doggo he loves Jennifer Aniston as Daniel finds out one day when the pair are sat watching one of her films the bond between the two really grows and Doggo starts to play an increasing role in Daniel’s life, whether that be at home, in the workplace as part of Daniel’s new job yes he does take him to work every day or just the daily traumas that go through Daniel’s life Doggo is there. Regardless of where the story takes us you can be sure that it will all lead to Doggo. This is a beautiful told story it is not long in just over 200 pages but a real feel good book that even guys will be happy to read even if they will not admit to it. 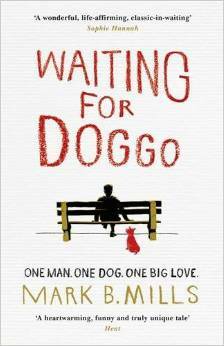 Waiting for Doggo is a funny heart-warming tale of a man and his dog. I just have the feeling that we may not have heard the last of Daniel and Doggo. Mark Mills graduated from Cambridge University in 1986. He has lived in both Italy and France, and has written for the screen. 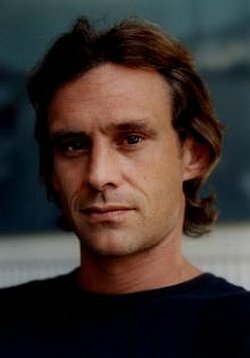 His first novel, ‘The Whaleboat House’, won the 2004 Crime Writer’s Association for Best Novel by a debut author. His second, ‘The Savage Garden’, was a Richard and Judy Summer Read and No 1 bestseller. He lives in Oxford with his wife and two children. Posted on August 22, 2015, in Headline Review, Mark B. Mills, Waiting for Doggo. Bookmark the permalink. Leave a comment.